Bars March: Own the Parched March PUP-UP! For the very first time, some unique artworks specially created for Parched March have made their own tour of Sydney bars - and now YOU can own them! 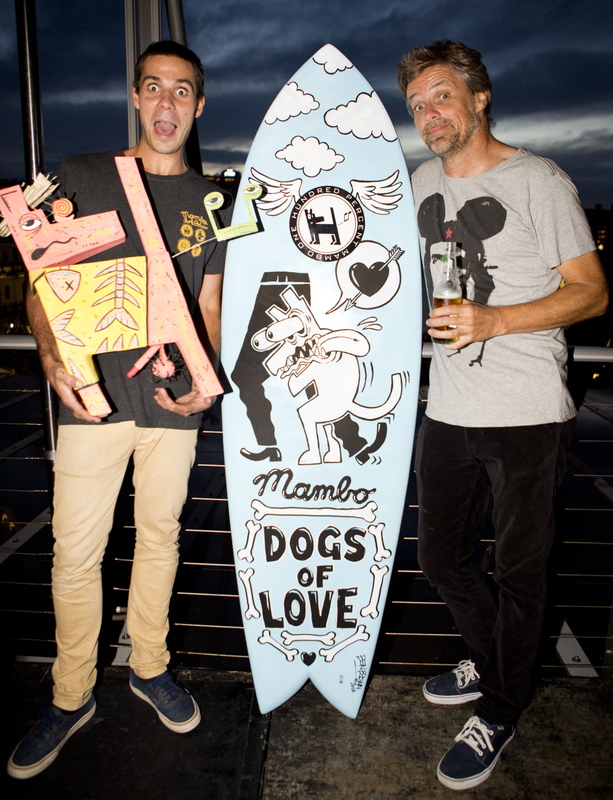 You might have spotted them while sipping a Cointreau Poodle or Disaronno Sour in one of our Parched March participating bars; four one-off dog statuettes and a spectacularly painted surfboard - all designed by celebrity artists. 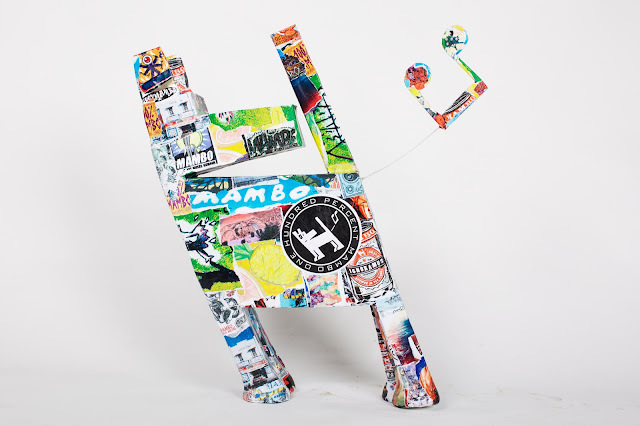 These works are our Parched March PUP-UP and appeared throughout the month in bars including Gazebo Wine Garden, Li'l Darlin, NameThisBar, Kaya, O Bar and Dining, Cohibar and Bondi Social. The PUP-UP was specially created for us by artist Tanya Dobble, celebrity gardening expert Jamie Durie and Mambo artists, and has been a major hit with everyone who's encountered them while enjoying Sydney's brilliant bars. Just like the animals helped by our partner charity, Animal Welfare League NSW, these artworks need a permanent home. So we're auctioning them, and of course all the proceeds go to AWL NSW. Imagine displaying one of these beautiful pieces at home or work as a permanent reminder of your generosity and of the bonds we share with our animal friends. There's one for every taste, from Jamie Durie's Bodhi, with her rusty finish and little flower pot, to cheeky Neil, a colourful and very well-embellished Farting Dog from our mates at Mambo. Modogliani the greyhound is an elegant tribute to rescue dogs, symbolizing the Parched March cause. 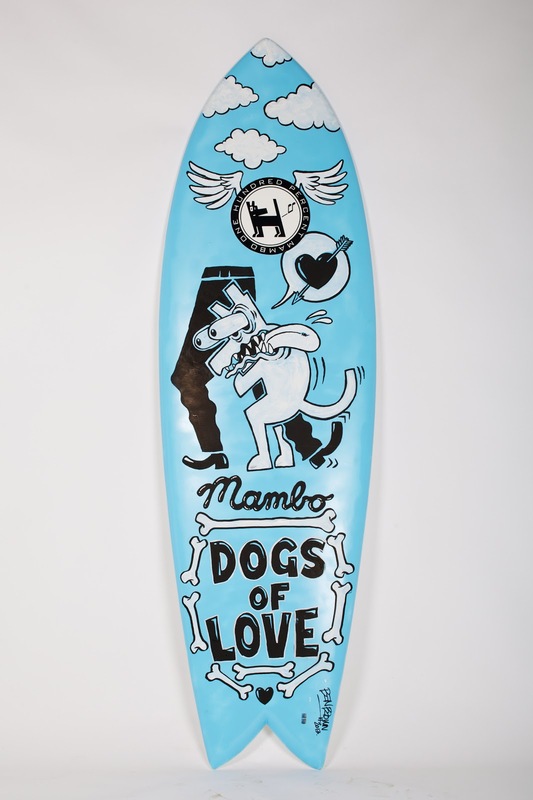 And if you love the ocean and animals, how could you go past the spectacular surfboard Vincent Van Hump, painted by Mambo artist Ben Brown as a tribute to his labrador? The works are now available for sale with a final auction at our wrap party this Wednesday 3 April. You can bid on this page, using the comments section at the bottom of this story. Simply post your bid there, or any questions you have about the works. The highest bid for each work in this pre-auction wins a ticket to the wrap party to bid in the live auction. This highbrow, culture-defining piece of work is devoted to all those faithful companions who show undying love and dedication to their masters - as only they know how. It is based on the true-life relationship I share with my white labrador - he is always happy and overly affectionate. He originally came to us as a guide dog puppy and we raised him to the age and standard where he was sent off to guide dog school. Alas, he didn't quite make the grade, his career was curtailed and luckily for all involved, he came back home. The styles used in this drawing are those of Richard Allen, the iconic designer who created the Mambo dog motif, and Ed 'Big Daddy' Roth, another personal favourite. Bodhi is a Rhodesian ridgeback, inspired by and named after TV garden design guru and Parched March ambassador Jamie Durie's own beloved ridgeback. A collaboration with Jamie evolved into an outside garden concept after it was decided we all liked this dog's base wire sculpture to be left as it was, rather than apply any covering. The rust application gave our Bodhi the beautiful rust colour reflective of the real Bodhi’s coat, and her love of the outdoors is shown through her little growing pot. She even has her own JD dog tag. Modogliani is a dedication to all the rescued greys particularly the ex racers, his ear tattoos a testament to his former life. 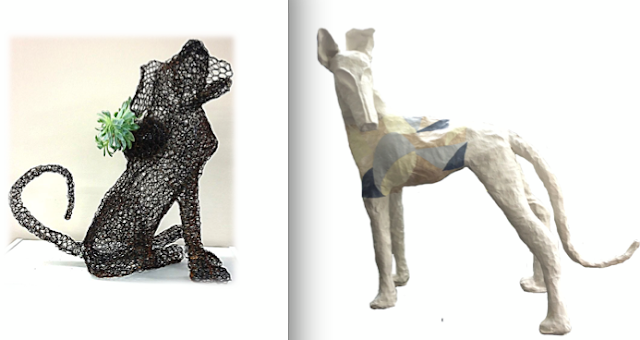 As his wire form took shape and I began to apply the papier mache, Patch and Sox my own rescue greys, started to investigate and with their innate curiosity tried to gauge if he was a friendly new member of our pack. Male greys often take on the nurturing role. His elongated, simplified form reminded me of Modigliani's work and so his sculptured face evolved. His pose is typical of my greys, dignified and regal, but always eager to know what's going on and not to miss out on anything. He is now wearing a happy coat ready to be adopted into a loving household and be treated with the affection and respect he deserves. 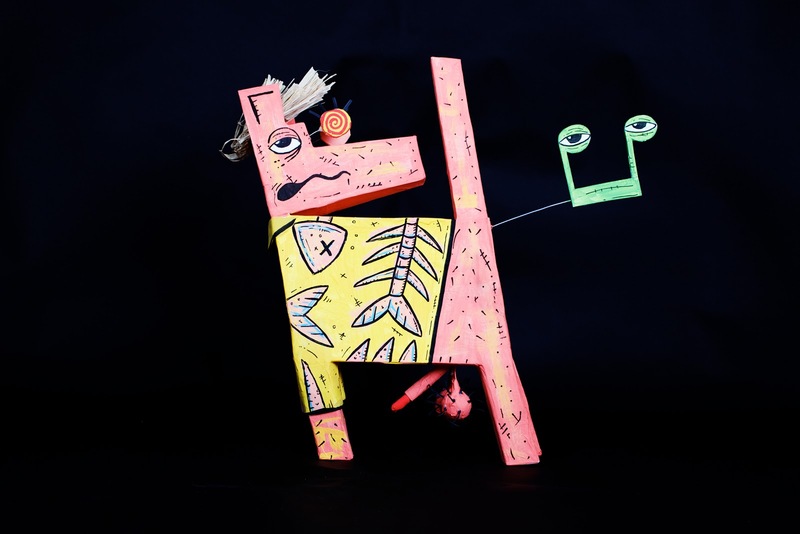 Rod is not just a much loved member of the Mambo family but also an enthusiastic retriever of sticks, golf balls and on occasion, ‘longnecks’ accidently dropped off the studio veranda. For most of the past 28 years, Rod’s coat has remained a luminescent white with only a rain-soaked music festival or a night spent under a bush sleeping off a hangover causing temporary damage to his gorgeous hair suit. That was until recently. While visiting a shed out back of the studio (a storage facility for flammable solvents, print samples, financial statements and spare parts for the hot tub) Rod discovered that the power was out and so struck a match to illuminate the darkened interior. The flame caused an explosion that rattled the teeth of pensioners playing bingo in a bowling club across the Harbour. When Rod was eventually found - in a back yard, two suburbs away, he was barely conscious and covered in a heat fused ‘catalog’ of recent Mambo prints. After regaining consciousness Rod decided that he liked his new coat so much that he has decided to keep it. In addition to attracting the attention of local canine females the prints have an AVU rating of +45, giving Rod extra protection from the sun’s harmful rays.